Laser Etched portraits are growing in popularity for cemetery memorials. 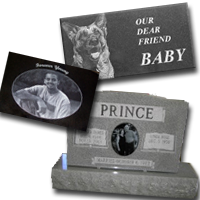 Since laser etching is permanent, these photos are a great way to personalize a headstone. Portraits can be laser etched directly onto black granites such as India Black and Midnight Black. To add a portrait to lighter colored granite, like gray, a laser etched tile can be inlayed into the headstone so that it is permanently set flush with the face of the stone. Laser etched photos are only as good as the photo provided to our designer for etching. Please submit photos that are 3" x 5" or larger if submitting the original photo (smaller professional portraits may be acceptable) and if you are providing a digital copy, the resolution should be at least 300 dpi. Please feel free to submit a photo for review to see if it is suitable for etching. Our designers will review the photo and let you know if a replacement photo is needed.